Let us now mention several names of significance in the history of Croatian medicine. Valent Cibel (born in Varazdin about 1490), a canon in Pecuh, wrote one of the first anti alcoholic publications in history. Gjuro Baglivi (born in Dubrovnik, 1668-1707) was a professor of anatomy and theoretical medicine in Rome (Sapienza) already at the age of 28, and the Pope's physician. He developed a theory that living fibre was the anatomical and physiological element of all pathological processes (fibral pathology). He also had some essential discoveries in the fine structure of muscles. His collected works written in the Latin language had more than 20 editions, translated into Italian, French, German and English. Académie Française accepted him as "membre d'honneur". Baglivi was also a member of the Royal Society in London. His Ragusan colleague Anselme Banduri (1675-1743) became a famous antique numismatist in Paris, and entered Académie des Inscriptions et Médailles. Gjuro Dubrovcanin (Gjuro de Ragusa, that is, Gjuro from Dubrovnik) published his "Epistolae Mathematicae" in Paris in 1680. Mihajlo Soretic (1741-1786), a Croat who was born and lived in Hungary, was a professor at the Universities of Trnava and Budapest. He conjectured the law of the specific energies of senses. Niko Ostoic (born on the island of Hvar, 1810-1848) wrote a book about the influences of light on human body, one of the pioneering works on modern heliotherapy. Ferdinand Hadvig was a surgeon in Zagreb who completed his studies in Prague in 1791. There exist documents confirming that already in 1792 he was vaccinating children in Zagreb against smallpox. He was also teaching parents about methods of prevention against smallpox. Historians of medicine claim that the first smallpox vaccination in Zagreb took place before the earliest known such vaccination in England, which was considered to be the earliest in Europe. This was discovered by Lelja Dobrinic, outstanding Croatian historian, curator of the Zagreb City Museum, see Vjesnik, May 29-30, 1999, p. 35. Franz Leopold Jelacic (1808 Dorpat-Tartu / Estonia - 1888 Kazan / Russia) is a descendant of noble Croatian family of Jelacic (Russian branch). He studied in Vilnius in Lithuania. After his specialization in Berlin, Vienna, Paris and Munich, he founded The University Clinic in Kazan, for which he obtained felicitations from a minister in 1845. Count Edgar Bourée de Corberon (1807-1861) was descendant of an old French noble family (born in Troissereux, dpt. of Oise), polyglot and interesting Croatian intellectual. In 1845 he arrived to Zagreb, and settled in Janusevac near Brdovec, the most beautiful Croatian palace at that time. He was a good friend to Ban (viceroy) Josip Jelacic. In his letters Corberon wrote about Croatia as his second homeland, about dangers of intensive magyarization (in his letters to the Hannover king Ernest August I written in French) in turbulent years around 1848. His generous material support of various Croatian institutions persuaded him to leave the palace of Janusevac, and to settle in Bisag, in Draskovic's palace near Komin. In 1851/52 he urged Ban Josip Jelacic to reestablish the University of Zagreb to full extent (in 1850 the Faculty of Philosophy was cancelled), offering his help as a potential lecturer. As a witness of epidemic of typhus and cholera in Croatia in 1851 he asked the Austrian monarchy officials to open the Faculty of medicine in Zagreb, suggesting its precise structure. Unfortunately, the faculty of medicine was opened only in 1917., during the reign of Emperor Franz Joseph I. By the end of his life Corberon wrote his Programm für die Erweiterung der Königlichen Akademie Agram [Zagreb] to einer volständigen Universität, but the sudden illness and death prevented him from completion of his work. According to his last will, he was buried in Croatia in Bisag. How much he loved his new homeland can be seen from the fact that (also according to his last will) even obituary notices in his native Troisseraux in France had to be printed in Croatian. See Alojz Getliher, Marulic 3, Zagreb, 1999, pp 528-537. 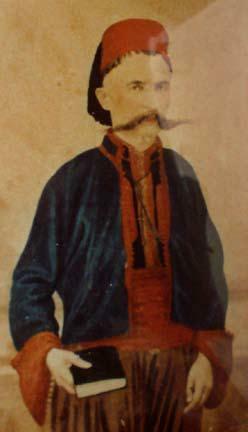 Fra Mijo Sučić (1820-1865. ), born in Livno in Bosnia and Herzegovina, was the earliest known surgeon in this country. He studied philosophy and theology in Venice, and medicine in Padova, specializing in surgery. 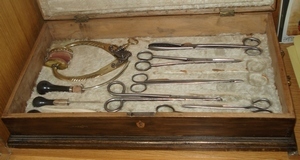 His surgical instruments are kept in the Franciscan Monastery Gorica in Livno. The oldest orthopedic institution in Croatia and one of the oldest in Europe, is the hospital for orthopedic surgery and rehabilitation "Dr Martin Horvat" in Rovinj, a lovely coastal town in Istria. It was founded in 1888 by Viennese physicians for children from Vienna. It is interesting that Robert Koch spent two years, 1900 and 1901, on the island of Brijuni near Istrian peninsula, when the malaria disease appeared. There is a monument of Robert Koch carved in live rock, and also his bust. This famous physician and scientist gave impetus to prevent malaria not only on the Brijuni islands, but also in Istria, by drainage of swamps. Karl Heitzmann (a German, born in Vinkovci, 1836-1896) was a histologist and pathologist and worked in Vienna and New York. He was the first who described hematoblasts. Emanuel Klein (1844-1925), a Croatian Jew born in Osijek, worked as a bacteriologist and histologist in London. He described many fine, until that time unknown structures of human body, and discovered Bacillus enteritidis sporogenes. He proved the streptococal etiology of scarlatina. Ante Grosic (Antonio Grossich, born in the village of Draguc in Istria, 1849-1926), the head of the surgical ward in the Hospital of Rijeka, was the first to introduce iodic tincture in preoperative disinfection of patient's skin. Stjepan Poljak (1889-1955), a neuroanatomist, was a professor in Berkeley and Chicago. He was successful in some fundamental discoveries concerning the delicate structure of retina. Milislav Demerec (1895-1966) worked in the field of genetics in the USA. He had various discoveries in the genetics of bacteria and grew a sort of mould that improved the production of penicillin. President of the American Genetics Society and editor in chief of Advances in Genetics. Director of Carnegie Insitute, Goldspring Harbor, and collaborator of Croatian Encyclopaedia. Jaroslav Havlicek was born in Croatia, in Garesnica (1879 - 1950), of the Czech nationality. His steam boiler fed by coal powder represented a revolution in building large power supplies. A reputed journal Applied Mechanic's Review included him among 10 most important personalities in the history of energetics (besides Volta, Fermi, Edison, Tesla). His major inventions were completed during his stay in Brno (Czechia). Since 1919 he was a professor in Zagreb. Croatian reader may be surprised to learn that in Argentina there are rivers like Korana, Kupa, Cetina, Una (confluents of river Chany), then Bosna, Lika, Mura, Sava, Drava, Drina (confluents of river Relem). There are also waterfalls Budak and Mime (Rosandic). This is due to Croatian scientist Ivica Frkovic, who led topographic investigations in the south of Argentina in the province of Neuquen near Chilean border. He discovered new, till then unknown rivers, to which he gave Croatian names. He also named two lakes in the region by the names of his daughters Jasna and Mirna, killed in 1945 during infamous Way of the Cross in Yugoslavia, immediately after the WW2. In 1946 president J.D. Peron allowed 35,000 Croats to enter Argentina, to save them from persecutions of Yugoslav state, and among them there were many intellectuals. The founder of the first faculty of forestry in Argentina is dr Josip Balen, together with his Croatian colleagues (Santiago del Estero in the north of Argentina). Eduard Miloslavic (Edward Lucas Miloslavich, 1884-1952) was a descendant of Dubrovnik emigrants to the USA, born in Oakland, California. His family returned to Dubrovnik in 1889. Ed studied medicine in Vienna, where he became a professor of pathology. In 1920 an invitation came from the Marquette University in Wisconsin, USA, to take the chair of the full professor of pathology, bacteriology and forensic medicine. In subsequent years "Doc Milo", as colleagues called him, inaugurated criminal pathology in the USA. As an outstanding specialist he was also involved in investigations of crimes perpetrated by al Capone gang. He was one of the founders of the International Academy for Forensic Medicine, member of many American and European scientific societies and academies, and also vice president of the Croatian Fraternal Union (CFU) in the USA. In 1932 he moved to Zagreb, where he was a full professor at the Faculty of medicine until 1944, when he moved again to the USA. He was lecturing also pastoral medicine at the Faculty of Theology in Zagreb, and was known as ardent adversary of abortion and euthanasia. In 1940 he was elected member of the prestigious"Medico-Legal Society" in London, in 1941 promoted the full member of the Tzarist Leopoldine Carolingue Academy of Natural Sciences in Germany, and doctor "honoris causa" at the University of Vienna, where he started his scientific career. For his 1943 investigation of the slaughter of 12,000 Polish officers perpetrated by Soviets in the Katyn wood in 1940, see here. By the end of 1944 he moved again to the USA (St.Louis, Missouri), where he was working until his death. It is important to note that after his initiative in 1941 the Faculty of Medicine in Sarajevo was founded in 1944 during the NDH regime. According to an article published in Vjesnik, December 27, 1992, due to his testimonies related to Katyn wood tragedy, Prof. Miloslavic was sentenced to death in absence by the ex-Yugoslavia. For more details see the CROWN - Croatian World Network. See also hr.wikipedia.org/wiki/Eduard_Miloslavić in Croatian. 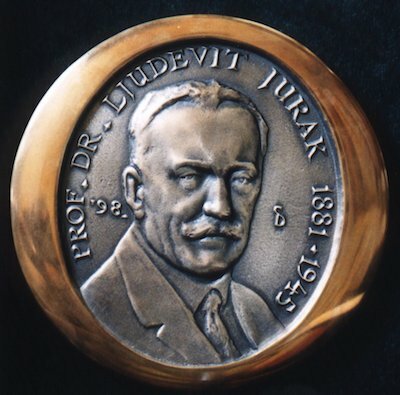 Ljudevit Jurak, distinguished Croatian pathologist and humanist, assasinated in 1945.
of the University of Zagreb. One of the great tragedies of the Second World War was the slaughter of 12,000 Polish officers in the Katyn wood (Poland) in 1940. Also a mass grave with more than thousand Ukrainian peasants and workers in Vinica (Ukraine), killed in 1938, was found by Germans. The Soviets accused Germans for these horrible crimes, and vice versa. Among leading European experts from 12 countries in pathological anatomy, two Croatian specialists were invited by the International Committee of the Red Cross to take part in the investigation in 1943: prof.dr. Eduard Miloslavic and prof.dr. Ljudevit Jurak. The result was that this cold-blooded mass slaughter was committed by the Soviets. Prof.dr. Miloslavic emigrated in time from ex-Yugoslavia to the USA by the end of WWII, while prof. Jurak remained in Zagreb, and was imprisoned on the demand of the Russian NKVD by the Yugoslav communists in May 1945. It was offered to him that he would not be accused as a military criminal and that his life would be spared if he declared that his report for the Red Cross Committee had been signed under pressure. He refused to do so, fully aware of the consequence. For example, NKVD officers forced Bulgarian specialist Markov to withdraw his signature under the threat of death sentence. Ljubica Stefan: Ljudevit Jurak - nasa rana i ponos. Since 1991, the Department of Pathology of the Sisters of Mercy Clinical Hospital Center in Zagreb is bearing the name of Ljudevit Jurak (i.e., the "Ljudevit Jurak" Clinical Department of Pathology). Since the same year, the Center organizes the annual Ljudevit Jurak International Symposium on Comparative Pathology. 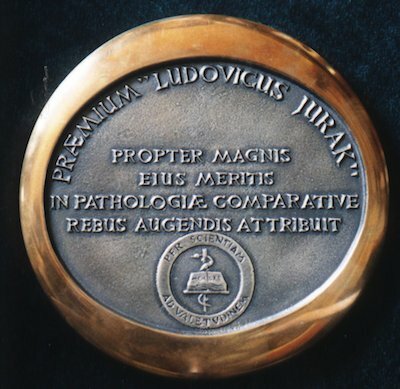 In 1998. the "Ljudevit Jurak" Award for Comparative Pathology was created. When the University of Zagreb was founded in 1874, the Viennese government of the Austrian-Hungarian Empire did not permit to open a medical school. 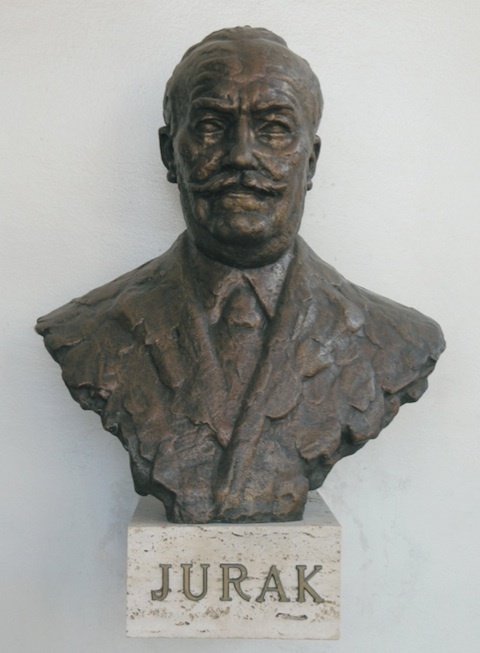 Professor Drago Perovic (1888-1968), a Serb born in Herzegovina in Trebinje, who completed his studies in Vienna sub auspiciis regis, was one of the founders of the medical study at the University of Zagreb in 1918. He was one of our experts in the field of anatomy. He was one of important collaborators of Croatian Encyclopedia, initiated in 1930s, and printed in part during the WWII in Zagreb (see his extensive article Anatomija there). He was editor in chief for basic medicinal sciences for the Croatian Encyclopaedia. Andrija Stampar (1888-1958), professor at the University of Zagreb, was our leading authority in the field of epidemiology and a pioneer in preventive medicine. After the assassination of Stjepan Radic in the Belgrade Parliament in 1928 and the dictatorship of king Alexandar he refused to enter the government of the then Yugoslavia. Since he was forcefully retired at the age of 42, he decided to go abroad, see [Lang, p 16]. As an expert of the League of Nations he spent three years (1933-1936) in China, developing the health service there. During the WW2 he was arrested by the German Nazis and kept in custody in Graz in Austria. He was one of the founders of the World Health Organization (WHO) and very active in promoting the health service in Afghanistan, Egypt, Sudan and Ethiopia. He wrote the introductory declaration of the Statute of the WHO and was the first president of this organization. 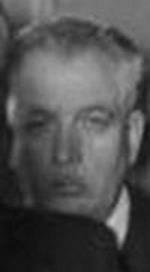 In 1948 Andrija Stampar was the chairman of the first WHO General Assembly in Geneva. In 1955 he was awarded the medal of Leon Bernard, which is the most prestigious international acknowledgement in the field of social medicine. For more details see his book The first ten years of the World Health Organization, Geneva, 1958. Each year since 1993, during its Annual Conference, the Association of Schools of Public Health in Europe (ASPHER) awards the prestigious Andrija Stampar Medal to a distinguished person for excellence in the field of Public Health. Stampar was a good friend to Maxo Vanka, a famous Croatian painter. Ivo Macela (1891-1952) was distinguished Croatian medical scientist, professor at the Charles University in Prague and at the Comenium University in Bratislava. In 1945 he founded the Medical Faculty in Plzen in Czech Republic, run the Chair of Pathology and was elected a Vice-President of the Medical Faculty in Plzen. In 1947 he was nominated unanimously candidate for the Nobel Prize by the Council of Professors at the Medical Faculty of the Charles University in Prague, for his research and important achievements in endocrinology, in particular for his contribution in research of insulin per os, taken by mouth. He was a good friend and colleague of professor Lavoslav Ruzicka, Croatian Nobel prize winner. The most outstanding representative of the Croatian medicine, our specialist of international reputation in the field of othorhinolaryngology, was Ante Sercer (1896-1968). Due to his efforts a faculty of medical science was founded in Sarajevo in 1944 (terribly bombed by Greater Serbian aggressors since 1992). He was the editor in chief of our Medical Encyclopedia (the first edition appeared in ten volumes, over 700 pages each, in 1957-1965), which was one of the first in the world. It is interesting to mention that the famous jazz trumpeter and singer Louis Armstrong-Satchmo was professor Sercer's patient in Zagreb, and was treated carcinoma of his lower lip in the sixties. He also cured Mario del Monaco and Giuseppe di Stefano. The initiative to open the faculty of Medicine in Sarajevo was given by professor Eduard Miloslavic. He also suggested to open the Faculty of Oriental studies in Sarajevo, and the Sheriatic theological faculty. 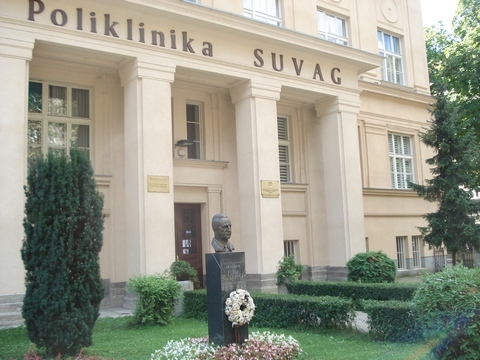 The University of Zagreb helped during the NDH period (WW2) the Sarajevo faculty of medicine with 15 tons of professional equipment necessary for teaching, and books. 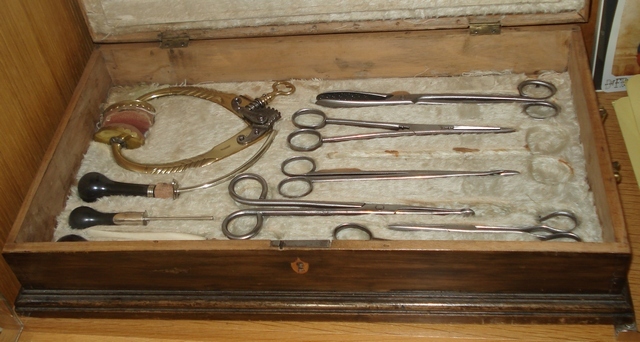 Due to war operations in Bosnia going on in 1944/45 it was not possible to transport further equipment for the faculty. When WW2 ended, academician Ante Sercer was sentenced by Yugoslav communists to one year of forced work, and his property was confiscated. He was found guilty among others for having supported the NDH regime to build the faculty in Sarajevo (while the faculty continued its activity after 1945 only due to initial efforts of Croatia during NDH period). And during the ustasha regime in Sarajevo the faculty had 8 professors, among them two Serbs (Zarko Prastalo and Milutin Gligic), and one Muslim (Muhamed Kontardzic). Out of 180 students, about 35% Muslim, 35% Croats, 25% Serbs, and 5% the rest, including Jews. For more information see dr. Vladimir Dugacki: Prvi medicinski fakultet u Sarajevu (1944-1945), Marulic, 1999, 2, Zagreb, p. 282-285. Vladimir Sertic (1901-1983) was a microbiologist. He discovered and classified several bacteriophages, among others the famous Fi X 174. He was working for 11 years (1929-1940) in Paris in the Laboratory of Felix d'Herelle, the discoverer of bacteriophages. His collaborator in Paris was Nikolai Bulgakov, who emigrated from the Soviet Union and completed his medical studies in Zagreb. The famous Russian writer Michail Bulgakov (the author of `Master and Marguerite') was Nikolai's brother. Franjo Kogoj (1894-1983), dermatologist, discovered the endemic disease on a beautiful Croatian island of Mljet (the Meleda disease). Vladimir Hudolin (1922-1996), distinguished Croatian psychiastrist of worldwide reputation, was born in Croatian town of Ogulin. During about 30 years his was director of the Psychiatry, Neurology, Alcohology and other Addictions Clinic at the University of Zagreb. He served as consultant of World Health Organization (W.H.O. ), and devoted most of his time to the study of problems related to alocohol and other drugs, since the early 1950's. Professor Hudolin has founded the first Club of Alcoholics in 1979, in Italian city of Trieste. Since then, upon his initiative more than 2500 such clubs have been opened in Italy only. Since 1990s the clubs of alcoholics, using the methodology of professor Hudolin, have been founded in Spain, Russia, Albania and some other countries. Among numerous international recognitions we mention honorary citizenship of San Daniele del Friuli in Italy in 1983. Mirko Drazen Grmek (1924-2000), born in Krapina near Zagreb, was professor of history of medicine at the University of Zagreb, where he founded Institute for History of Science, and directed the first Croatian Medical Encyclopedia. Since 1971 he has been full professor at the Sorbonne in Paris, then associate professor of many European and American universities (Berkeley, Cambridge-Masachusetts, Geneva, Lausanne, Bologna, Rome, Zagreb), and finally Director of Studies at the École Practique des Hautes Études, Sorbonne, Paris. He was director of International school for history of science in Naples, Ischy, Annecy, president of European center for history of medicine in Strasbourg, editor or editor-in-chief of several professional international science lexicons, author of about thirty books. He introduced the concept of pathocenosis ("the ensemble of pathological states present in a specific population at a given moment in time") in 1969. Very important is Western medical thought from antiquity to the Middle Ages, a landmark work edited by Mirko D. Grmek. His monograph History of AIDS: Emergence and Origin of a Modern Pandemic, is winner of the George Sarton Medal of the History of Science Society. For his scholarly achievements he was awarded with the order of the Knight of the French Legion of Honour in 1966. On that occasion professor Grmek stated that he considered this decision not only as a recognition of his work, but also as a sign of friendship between France and Croatia (for more information see here [PDF]). 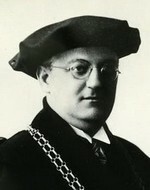 He also obtained Laurea ad Honorem from Università di Bologna. In the early 1990s he advocated Croatia's right to independence through several appearances on French television, and was the first president of Almae Mater Croaticae Alumni in Paris. Mirko Grmek is as famous among scholars throughout the world as he was unknown to the wider public. This Croat lived supporting the ideals to which he dedicated his entire life, namely that medicine must be practiced with full sense of conscience, and that science is simply another word if it is not accompanied by humanism. La vita, la malattia e la storia, Di Renzo Ed., Rome 1998 (French translation La Vie, les maladies et l'histoire, 1999). His books (more than 30) are published in several languages: French, Italian, German, Polish, English, Croatian. Gabriel Gasic Livanic (1912-1996) was outstanding Chilean biologist, born in a Croatian family of goat herders in Punta Arenas on the very south of Chile. He was professor at the University of Chile in Santiago, specialist for cancer and leukemia. Since 1965 he moved to the USA, where he became professor emeritus of the Medical School of the University of Pennsylvania, and honorary member of the Hospital of the University of Pennsyilvania. He published his scientific works in prestigious journals like Nature, Science, Journal of Cell Biology, Cancer Research and Proc. National Academy of Sciences. Danko Brncic Juricic (1925-1998), a Croat born in Punta Arenas, was a founder of genetics scientific studies in Chile, a member of the Chilean Academy of Sciences. He was a student of Professor Gasic. In 1987 Professor Brncic was awarded the National Prize for Science, and obtained a recognition from the Croatian Society in Punta Arenas ("...fue galardonado por la colectividad croata de Magallanes con la primera medalla al mérito científico y cultural"). He is one of the founders of the Genetics Society of Chile (Sociedad genética de Chile), and one of the founders of the Latinoamerican Society for Genetics (Asociación latinoamericana de genética) in 1970, and its first president between 1971-1974. More information, and also [Domic Bezic]. The SUVAG center for voice transmission for reeducation of speech disorders and deafness has been founded in Zagreb in 1961 by Academician Petar Guberina (1913-2005). The name of SUVAG is coined from Systeme Universel Verbotonal d'Audition Guberina. the Officer’s Cross in 1989, which he was awarded in the main quadrangle of the Sorbonne in Paris, by president François Mitterand. 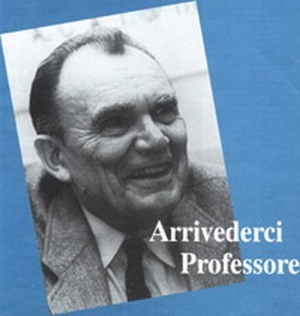 Petar Guberina earned his PhD in 1939 at Sorbone in Paris, and the title of his thesis was Valeur logique et valueur stilistique des propositions complexes en français et en croate. During his stay in France he wrote a study about African poetry of French and English provenance. 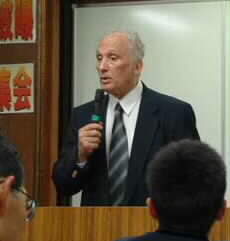 Petar Guberina lectured about his verbotonal method in more than 60 countries throughout the world. Till 2007 as many as 84 Croatian specialists from the SUVAG center in Zagrebu gave practical lessons in 44 countries. On the territory of the Russian Federation only there are 35 institutions which use the verbo-tonal system of Petar Gurberina in their work. Kresimir Krnjevic, is outstanding Croatian neuroscientist working in Canada. He had a “complicated early life history” because his father had been active as a Croatian politician in the 1920s and ’30s. Born Zagreb, 1927, he was the son of Juraj Krnjevic, General Secretary of the Croatian Peasant Party and youngest elected member of the Yugoslav Parliament who, 1930, left Croatia to appeal for Croatian democracy at the League of Nations, Geneva, Switzerland, after King Alexander took power. With substantial autonomy granted in 1939, the family returned to Zagreb but when Germany invaded Yugoslavia, 1941, Juraj, as a senior government official, left Zagreb, first for the Middle East, then England, while Kresimir and his sister attended high school, Capetown, South Africa. Reunited with his father, 1944, Kresimir attended Edinburgh University, earning an M.D., 1949, and Ph.D., 1954. Interested in brain research, he continued his post-doctoral studies at the University of Washington, Seattle, 1954-56, and at the John Curtin School of Medical Research, Australian National University, Canberra, 1956-58, before returning to the U.K. as Senior Principal Scientist Research Officer, Babraham Institute, Cambridge. Invited to be a visiting Professor, McGill University, 1964, Montreal “proved so attractive” that he “could not resist the offer” to remain as McGill’s Director, Anaesthesia Research Department where he has taught, Department of Physiology, and has been The Joseph Morley Drake Professor since 1978, while conducting research on nerve cells and brain synapses. Fellow, Royal Society of Canada, 1975, other honours include the Gairdner Foundation International Prize, 1984, Officer of the Order of Canada, 1987, and the Wilder Penfield Prize, Government of Quebec, 1997. Though he retired, May, 1999, Dr. Krnjevi´c is still doing research at McGill. He is also a member of the Croatian International Initiative, a loose grouping of some two dozen individuals from the Croatian diaspora that promotes democratic institutions in Croatia. This text is from Croatians in Canada. Mladen Vranic (1930) is distinguished researcher and educator in medical sciences (endocrinology and metabolism) and former chair of physiology at the University of Toronto, where insulin was discovered in 1923. He earned the title of Honorary Medical Doctor Institute, Sweden. He is a Fellow of the Royal Society of Canada, and a member correspondent of the Croatian Academy of Sciences and Arts. He is the only Canadian who got most prestigious awards from American Diabetes association, and 2007 inaugural life achievement award from Canadian Diabetes association. Nelly Auersperg, b. Gutmann, distinguished Canadina scholar, started her studies of medicine at the Medical School of the Univeristy of Zagreb, Croatia. She is is one of Canada’s foremost cell biologists, an international leader in the establishment of laboratory techniques for the study of ovarian cancer. 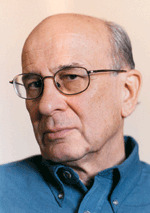 Pasko Rakic (1933), outstanding neurobiologist, professor at Yale, educated at the University of Belgrade (M.D. and Ph.D.), wrote the following: Both [science and art] want to find some meaning or order in the large picture of chaos. He is a member of the National Academy of Sciences, USA, the American Academy of Arts and Sciences, and of other national institutions, recipient of numerous honours throughout the world, including Croatia. "I consider Pasko to be one of the most brilliant neuroscientists not just of this generation but in the history of neuroscience," says Susan Hockfield (Nat. Med. 11, 110; 2005), former provost of Yale and now president of the Massachusetts Institute of Technology. "What he's contributed to neuroscience is really on the order of Cajal or Golgi [Nobel Prize winners, 1906]. ", see Nature Medicine. His wife Patricia Goldman Rakic, who tragically died at the car accident in 2003, was also outstanding neouroscientist. Both of them are founding editors of the prestigeous scientific journal Cerebral CORTEX, Oxford. Professor Pasko Rakic maintains a fruitful collaboration with his colleagues in Croatia. Since 2016 he is a fellow of the Royal Society (London, England), the first Croatian after Ruger Boskovic. Neuroscience in Croatia - PDF, with more detailed information about Pasko Rakic and Kresimir Krnjevic. Asaf Durakovic (1940) is a nuclear scientist and former Chief of the Nuclear Sciences Division at the Armed Forces Radiobiology Research Institute, USA. He earned both master's and doctoral degrees in medicine at the University of Zagreb. He is currently the Medical Director of the Uranium Medical Research Center, an independent non-profit institute which studies the effects of Uranium contamination. See his publications and current developments. See his short biography (and some of his poetry) published by the Croatian Medical Journal in 1999. The prize was awarded for the work on the issues of radioactive warfare, depleted uranium, and medical and environmental effects of nuclear weapons on the human habitat and biosphere. The prize is sponsored by over 134 nations. Dr. Durakovic is donating the $10,000 cash prize to UMRC's continuing work on nuclear and radioactive warfare. Professor Davor Solter (1941), born in Zagreb, studied medicine in his homecity where he earned his PhD. He was Director of the Max Planck Institute of Immunobiology in Freiburg from 1991 to 2996. 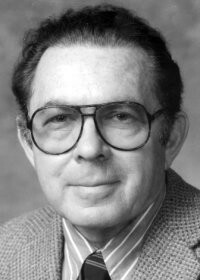 In seminal experiments studying the developmental potential of maternal and paternal genomes by nuclear transplantation, Davor Solter was one of the first to postulate genomic imprinting. Zagreb has one of the most prestigious ultrasound diagnostic centers in the field of cardiology and gynecology, founded by Professor Asim Kurjak. He founded the Ian Donald Inter-University School of Medical Ultrasound in Dubrovnik, Croatia in 1981. Professor Kurjak is past President of the European Association of Perinatal Medicine and past President of the international society “The Fetus as a Patient” and past secretary of the International Society of Ultrasound in Obstetrics and Gynecology (ISUOG). Many thanks to Yoko Nishii for translating the above two Japanese titles into Englesh. Croatian Medical Journal (CMJ) is a highly reputed international scientific journal founded in Zagreb by Matko Marusic, professor at the School of Medicine of the University of Zagreb. Professor Hedvig Hričak earned her MD degree from the University of Zagreb, Croatia, and her Dr. Med. Sc. from the Karolinska Institute, Stockholm, Sweden. She is the Chairman of the Department of Radiology at Memorial Sloan-Kettering Cancer Center in New York, the first woman on that position. Dr. Hricak is President-Elect and Secretary Treasurer of the Board of Directors of the Radiological Society of North America (RSNA). She is an honorary fellow of the Royal College of Radiologists and an honorary member of the British Institute of Radiology, German Radiological Society, Austrian Roentgen Society, Croatian Society of Radiology, Journées Françaises de Radiologie and the Swedish Society of Medical Radiology. Igor Stagljar, Croatian scientist leading of group of young scientists in Toronto, Canada, began developing an original biological method for the identification of new proteins involved in the development of cancer. This method paved the way for the research of grave genetic diseases, particularly cystic fibrosis. Igor Rudan, working on global health problems, is a fellow of the Royal Society of Edinburgh, Scotland. A considerable number of contemporary Croatian scientists are having a world wide reputation. It would be impossible to mention them all in a small essay like this. See [Distinguished Croatian scientists in the world, I, II, III]. A ground-breaking study about plague control measures in medieval and early modern Croatia. A vibrant city-state on the Adriatic sea, Dubrovnik, also known as Ragusa, was a hub for the international trade between Europe and the Ottoman Empire. As a result, the city suffered frequent outbreaks of plague. Through a comprehensive analysis of these epidemics in Dubrovnik, Expelling the Plague explores the increasingly sophisticated plague control regulations that were adopted by the city and implemented by its health officials. In 1377, Dubrovnik became the first city in the world to develop and implement quarantine legislation, and in 1390 it established the earliest recorded permanent Health Office. The city’s preoccupation with plague control and the powers granted to its Health Office led to a rich archival record chronicling the city’s experience of plague, its attempts to safeguard public health, and the social effects of its practices of quarantine, prosecution, and punishment. These sources form the foundation of the authors' analysis, in particular the manuscript Libro deli Signori Chazamorbi, 1500-30, a rare health record of the 1526-27 calamitous plague epidemic. Teeming with real people across the spectrum, including gravediggers, laundresses, and plague survivors, it contains the testimonies collected during trial proceedings conducted by health officials against violators of public health regulations. Outlining the contributions of Dubrovnik in conceiving and establishing early public health measures in Europe, Expelling the Plague reveals how health concerns of the past greatly resemble contemporary anxieties about battling epidemics such as SARS, avian flu, and the Ebola virus. Zlata Blažina Tomić: Kacamorti i kuga: utemeljenje i razvoj zdravstvene službe u Dubrovniku, Zavod za povijesne znanosti HAZU u Dubrovniku, Posebna izdanja Monografije, knj. 27, Zagreb-Dubrovnik 2007. Latvian: Riga - Leipzig 1804, reprint of Latvian and German translations in Riga 1804, Latvian translation in Jelgawa in 1805. 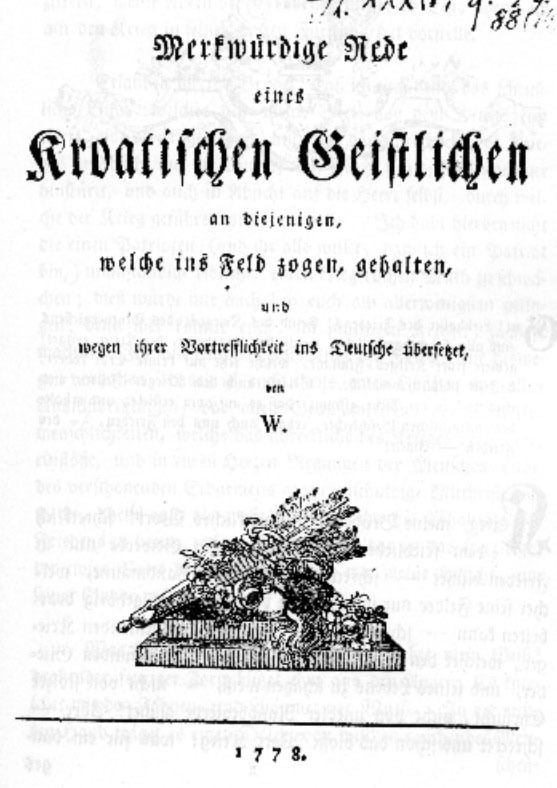 The German 1778 translation was retranslated back to Croatian language in Arapovic's monograph in 1999, where you can find also its English translation. It is very probable that the text was published in some other west-European languages as well. Note that this universal message of peace, religious tolerance and patriotism was translated in enemy countries (with respect to Austria), that were a part of Protestant Christianity. Dr. Borislav Arapovic is a honorary director of Biblical institute in Stockholm, Sweden. Born in Bisine, Bosnia and Herzegovina, in 1935, studied in Zagreb, emigrated in 1965 to Sweden due to political reasons, in Stockholm earned his Ph.D. In 1973 he founded The Institute for Translation of The Bible into Languages of (former) Soviet Union. In 1996 the Russian Academy of Sciences conferred him a doctorate honoris causa. In 1999 he was elected foreign member of the Russian Academy of Sciences. For the creation of the Children’s Bible in 1983, Dr. Borislav Arapovic was awarded the Leo Tolstoy medal by the Russian Children’s Fund. In the period of 1983-90 ten editions of the Children’s Bible in five million copies were printed for free distribution in Russia. Photo from the Institute for Bible Translation, Russia. For those who can read Russian, see Institut perevoda Biblii. See Arapovic's biography in Swedish. 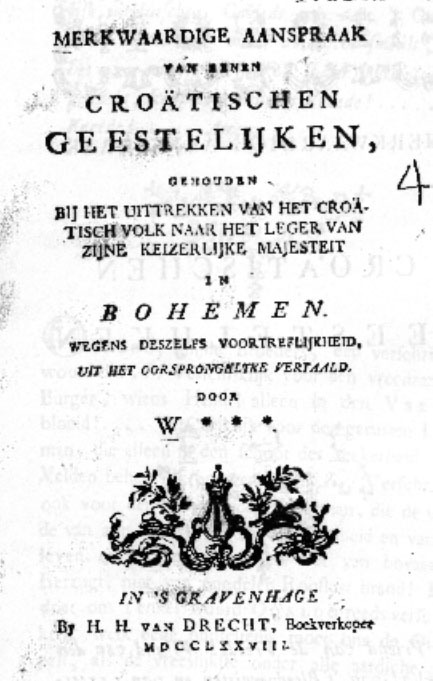 Kurze Anrede (A Short Address), Vienna 1779, 10 pages, containing Ivan Vukasovic's address to Croatian soldiers. The full title is A Short Address to the children of his parish made by Mr. Ivan von Vukasovic, Catholic parish priest in the town of Otocac in Croatia, on 3 January 1779, when following the end of the first campaign they returned home on leave and in their principal parish church raised a captured Prussian flag which had most graciously been presented to them. Translated from the Croatian language into German. Die Hemkunft der Kroaten (The Return of the Croatas), poem of an anonymous author, Vienna 1779. It is probably related to the town of Krizevci on the north of Croatia, and contains 37 stanzas of four verses each. “May God Bless Russia” – those were the concluding words of Dr. Arapovic’s response speech at the ceremony of awarding him an honorary Foreign Member’s diploma of the Russian Academy of Sciences. Born in 1935 in Bosnia Hercegovina, and later an immigrant to Sweden, Borislav Arapovic became the initiator of the foundation in Stockholm in 1973 of the Institute for Bible Translation (IBT), with the aim of translating and publishing Bible texts in the mother tongues of the indigenous non-Slavic peoples of the Soviet Union. He was the IBT Director for 24 years (until 1997). On his initiative at the beginning of the 1990s a branch of the Institute was opened in Moscow and a cooperation agreement was signed between IBT and the Russian Academy of Sciences. In 1997 with the blessing of the late Patriarch Alexiy II the Russian organization Institute of Bible Translation was able to move into offices on the premises of the former St. Andrew’s monastery, where it has remained until the present time. Over the years since then IBT staff have implemented a wide range of projects, translating different parts of the Bible into more than 80 non-Slavic languages of Russia and other countries of the CIS. On behalf of numerous Russian colleagues and friends Dr. Arapovic was welcomed and congratulated by academician E. Chelyshev. The solemn ceremony of the award took place in the presence of many guests, including a representative of the Croatian Embassy Mr. Igor Prelovsek. During the days of his visit to Moscow Dr. Arapovic also visited the office of the Institute for Bible Translation where he had friendly meetings with colleagues. Afganistan, Algeria, Angola, Bangladesh, Bhurma, Chad, Columbia, Cyprus, Egypt, Ethiopia, Gibouty, Guatemala, Honduras, India, Indonesia, Iraq, Italy, Ivory Coast, Kenia, Lebanon, Madagascar, Mali, Mauritania, Mozabique, Nigeria, Pakistan, Peru, Romania, Rwanda, Senegal, Somalia, Sri Lanka, Sudan, Syria, Tanzania, Upper Volta, Tunis, Turkey, Uganda, Vietnam, D.R. Yemen, former Yugoslavia, Zambia. Many individuals (painters, musicians etc.) and companies (especially food producing and transport companies) in Croatia contributed to the activity of the International Fund Hungry Child. Vladimir Palecek also founded and was the Secretary General of the International Committee for the Protection of Unborn Children (1986 in Vienna) and the International Mission for Science and Peace (1988 in Geneva). He collaborated also with Mother Teresa. 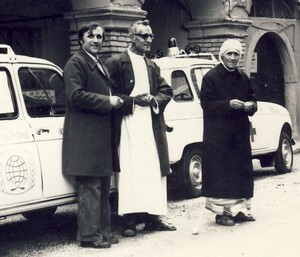 Mother Teresa in Zagreb in 1977 with Fr. Anto Gabric and Vladimir Palacek on the left. Many thanks to Snjezana Bozic for the photo. Vladimir Paleček: Gladno dijete, Obnovljeni život : časopis za filozofiju i religijske znanosti, Vol.34. No.6. Prosinac 1979. It would be hardly possible even to trace all the aspects of humanitarian activity during the years of the aggression on Croatia. Martyrdom in Croatian Homeland War (1990-1995), lecture delivered in Zagreb by dr. Juraj Njavro in 2005, surgeon at the Vukovar Hospital in 1991, [PPT, in Croatian]. My deep gratitude to dr. Njavro for permission. The Wall of Pain (Zid boli) in Zagreb is a memorial for all Croatians who were killed or disappeared during the Greater-Serbian aggression on Croatia (1990-1995). Here is the list of killed children during Serbien siege of the city of Vukovar. Three of them have been exhumed from the infamous Ovcara mass grave. Stefan Biro (ed. ): Vukovarska Bolnica 1991 (Vukovar Hospital in 1991), Vukovar 2007, 371 pp. In particular, see the article by Vesna Bosanac and Davor Bandiæ: Djeca u rati (Children in the War), pp. 230-236.